WHAT: Waiting for Godzilla, A miniature opera in three parts. Premiere of the NEW FULL LENGTH VERSION! WHEN: Friday May 2 thru Sunday May 11, Friday and Saturdays at 8pm and Sundays at 3pm. Combining the mythically scaled with a Beckett-like absurdity, Waiting for Godzilla is an opera in the grand tradition, but performed on a toybox scale. The effect is as if one was watching (and listening) to a fantasy opera through the wrong end of a telescope. Rather than an example of the cheesy kaiju (monster) movie genre, the original Gojira (1954) was a work of depth and gravity, a reflection of the horrors of the atomic bomb to a decimated post-war Japan. However, Godzilla’s rage and thirst for destruction are never explored. Waiting for Godzilla is a “back story,” an imagining of the motivations behind the action. As an opera, the classic explanation (and for the lion’s share of the operatic genre) is thwarted love. In the complete Godzilla canon there is only one possible object of affection: Mothra. Sometimes ally, more frequently foe, the protectoress of her people, she is the embodiment of light and counterpart to the kaiju’s darkness. But, as in most operas, a happy ending remains elusive. Waiting for Godzilla is performed on miniature stages and screens by three singer/puppeteers, “virtual orchestra,” and live instruments. 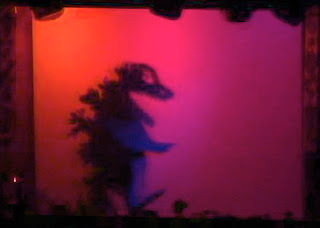 In a departure from marionettes or sock puppets, the show owes more to world of bunraku (in that the manipulators are always visible), or shadow theater. The various visual effects are drawn from “archaic” stagecraft of the Victorian theater. Waiting for Godzilla was developed under the auspices of the Z Space Studio Theater, San Francisco. Funding was provided by the Zellerbach Family Foundation, Theatre Bay Area CA$H Grants, the American Composers Forum SUBITO grants, and James A. Aleveras. Disclaimer: Waiting for Godzilla is a new musical theater work based on Godzilla as a cultural icon. The names Godzilla, Gojira, and Mothra are trademarked and copyrighted by Toho Co. Ltd. This work is not authorized by Toho Co. Ltd.; Randall Wong and NOHspace are not affiliates of Toho Co., Ltd.